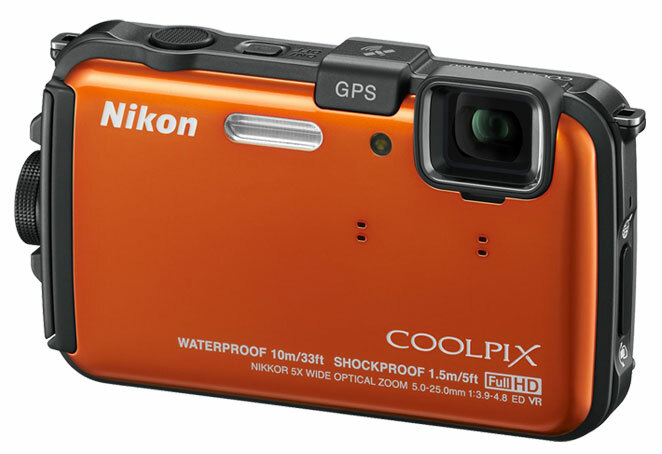 Nikon’s COOLPIX AW100 is a unique camera in that it is waterproof, allowing for underwater use to a depth of 33-feet. By following a few simple care guidelines, the camera will provide you with many exciting picture taking experiences. It is important to follow these guidelines and read your camera’s manual thoroughly before use to keep the integrity of the waterproof features intact. Make sure that there are no foreign substances inside the battery-chamber/memory card slot cover. Do not handle the camera with wet hands. Any foreign substances such as sand, dust or hair inside the battery-chamber/memory card slot cover should be removed with a blower or brush. Any liquid such as water droplets inside the battery-chamber/memory card slot cover should be wiped off with a soft dry cloth. Make sure that the waterproof packing of the battery-chamber/memory card slot cover is not cracked or deformed. The waterproof performance of COOLPIX AW100’s waterproof packing may start to deteriorate after one year. It is recommended that you consult your retailer or Nikon-authorized service representative once a year to replace the waterproof packing with a new one. Make sure that the battery-chamber/memory card slot cover is firmly closed. Rotate the battery-chamber/memory card slot cover latch until it clicks into place. Make sure that the thin cord of the camera strap does not get caught. Also, make sure that the latch indicator indicates “Close” status. Observe the following precautions to prevent water from seeping inside the camera. The camera should not be used underwater when the water temperature is lower than 32°F or above 104°F. Doing so can cause the camera’s waterproof integrity to fail. Because the interior of the camera and its accessories aren't waterproof, don't open the battery-chamber/memory card slot cover underwater. Don’t subject the camera to shock when using it underwater, which would occur if you jumped into the water with the camera. Also, the camera should not be used in high water pressure conditions such as rapids or waterfalls. Lastly, the COOLPIX AW100 doesn't float on its own, so it is recommended that you attach an appropriate strap to the camera with the properties that will allow it to float; otherwise if dropped, the camera will sink. These types of camera straps can be purchased at camera stores. If, while using your COOLPIX AW100, a substance such as sunscreen, hot spring water, bath mix powder, soap, solvents, oil, or alcohol gets onto the camera, immediately wipe it off. After using the camera underwater, it must be cleaned within 60-minutes, otherwise salt particles, hot spring particles, or other foreign substances could adhere to it, which could cause damage or deterioration of the camera’s waterproof performance. Take care before cleaning the camera, to thoroughly remove water droplets, sand, salt or hot spring particles, or other foreign substances from your hands, body, and hair. If such foreign substances were to drip onto the clean camera’s exterior it would negate the cleaning you just performed. Also, you don’t want any water or other foreign objects to drop inside the camera once it is clean and dry. Cleaning of the camera should be done indoors if possible, to avoid exposing it to water spray or sand. To clean the camera, immerse it in a shallow basin filled with freshwater for 10 minutes, shaking it sufficiently in the water to remove any foreign substances from adhering to the exterior. Air bubbles may come out of the water drain holes of the camera, from the microphone or speaker openings. 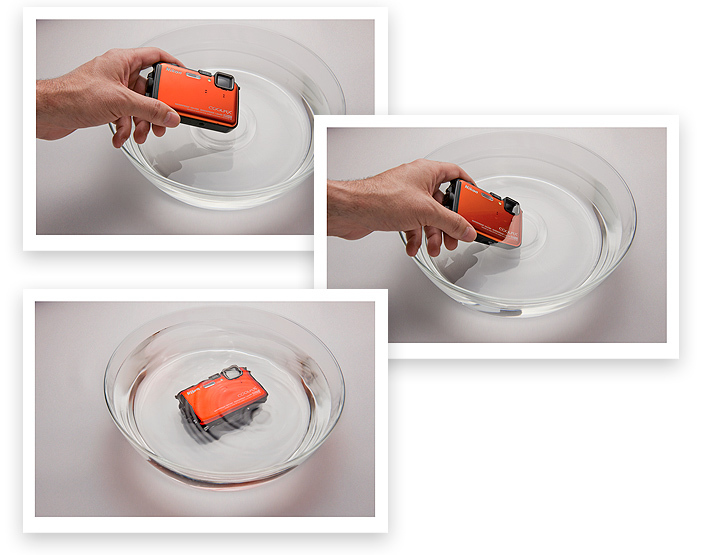 Do not place the camera under running water from a hose or faucet as this could damage the AW100’s waterproof integrity. Once the camera is fully rinsed, wipe it dry with a soft cloth and allow your COOLPIX AW100 to air-dry in a well-ventilated, shady place. You may notice water flowing out of the openings in the microphone or speakers, which is normal. The camera needs to be allowed to air-dry, so don't use a hot air hair or clothes dryer, chemicals or alcohol to dry the exterior of the camera. Damage to the waterproof packing or body of the camera by doing so can cause it to become deformed, which will lead to a deterioration of the AW100’s waterproof performance. Only after you're sure the camera is fully dry, you can open the battery-chamber/memory card slot cover to remove the memory card. Gently wipe off any water or sand remaining inside the camera with a dry soft cloth, taking care to thoroughly clean the waterproof packing. If the camera is exposed to shocks, it is recommended that you consult your retailer or Nikon authorized service representative to confirm the waterproof integrity of the camera is intact. Excessive shocks, vibration or pressure due to dropping or hitting the camera may cause the waterproof performance to fail. As with most electronics, the COOLPIX AW100 digital camera should not be left in a hot environment with temperatures over 104°F (in particular, a place exposed to direct sunlight, inside the cabin of a car, on a boat, on the beach, or near heating apparatus) for a long period of time, as this could cause deterioration of the waterproof performance of the camera.